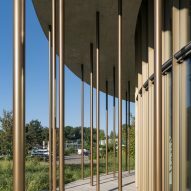 Slender metal columns support the offset concrete roof of this cylindrical office block designed by Local Architecture for the International Motorcycling Federation on the outskirts of Geneva. Swiss studio Local Architecture was appointed to oversee the design of the new headquarters, which is located between a railway line and a main road in the canton of Vaud. 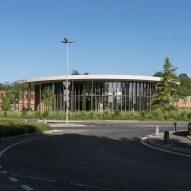 Described by the architects as "a pavilion in a park", the building replaces a former headquarters on the lower portion of a sloping plot dotted with trees. The structure is raised above the landscape on a concrete base that enhances its visibility from the nearby roundabout. Curving glazed surfaces surrounded by an array of columns lend the building a distinctive presence in a context distinguished by diverse architectural styles. 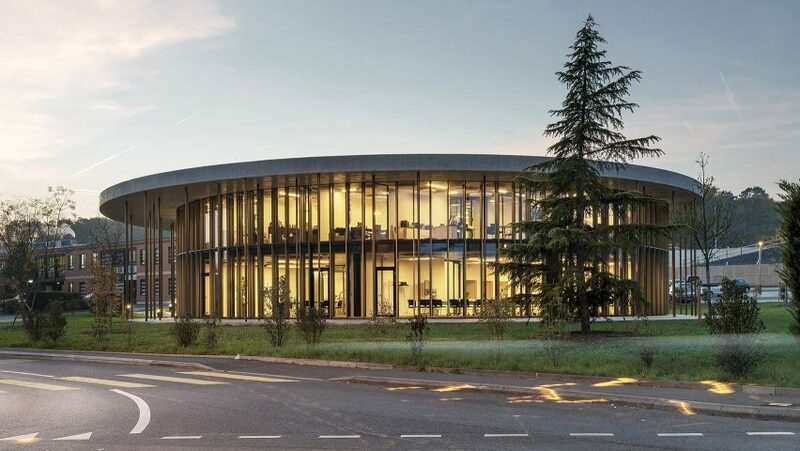 "Its circular forms evoke the movement and speed of the motorcycling world, suggested by the dynamic arrangement of the offset oval slabs connected by a forest of pillars," said the architects. "The vertical rhythm of the pillars and the depth of the facade produce a kinetic effect when viewed by passing drivers on the cantonal road or passengers on the railway." The two-storey building is set above an existing basement and reached via a pair of perpendicular paths. The main entrance connects directly with an adjacent access road, while a secondary entry leads out to a staff car park. Visitors are led towards a central hall dominated by a sweeping spiral staircase that ascends through a circular void to the administration and management spaces on the first floor. "Cast in concrete as a single unit, [the staircase's] triangular underside suggests a vertebrate structure – like a spinal column bearing the transparent framework of the building as a whole," said the architects. Daylight floods into the entrance hall through circular skylights that puncture the concrete ceiling above the staircase. Public amenities including an auditorium, training room, cafeteria and exhibition space are arranged around the communal central space. The various rooms are divided into a regular grid around the perimeter of the building and are intended to be flexible to accommodate different potential configurations. The oversized concrete roof slab is oriented to follow the sun's path across the sky and mitigate unwanted solar gain during warmer months. The circular theme is continued internally in the form of acoustic baffles, which are fitted to the concrete ceilings throughout the building. Photography is by Mathieu Gafsou and Joël Tettamanti.